We take this opportunity to clarify Guangdong Zhenrong Energy’s (GZE) position against the spreading of negative news in Curaçao on GZE and secure the confidence of the Curaçao people in us. Hong Kong High Court has not issued such order and GZE has never received such order. Hong Kong High Court has no jurisdiction on GZE, a central government-owned company. Based on the above fact, the above-referenced news has no merit and ground. We have sent a clarification of above statement in writing to the Multi-Disciplinary Project Team (MDPT) on September 29, 2017. We respect all news media’s freedom of speech. In the meantime, we also desire the government as well as its representatives to promote an opportunity and environment for fair and logical judgment so as to protect the dignity and right of an influential investor. GZE’s intention has been and will be sincere. We are offering billions of USD investment without government or bank guarantee, which is unprecedented in Curaçao as well Dutch history. We welcome all inquiries and investigation, but the intention needs to be honest, sincere, and with a full heart for the Curaçao people’s benefit and future. There is negative financial news on websites about GZE which was caused due to US sanction on GZE from 2012 to 2016 since GZE was working in Iran. The Chinese government is making the adjustment and we are confident GZE will get all these problems fixed because GZE shares 100% of ups and downs with the Chinese government. 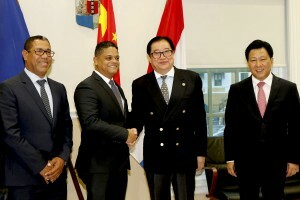 To avoid confusion and establish the confidence of Curaçao side, GZE also introduced CCIEE which is also a Chinese Central government-owned company and ranked No. 24 in the Top 500 of the world. CCIEE has the adequately strong financial capacity and will be GZE’s partner in equity for the project. This movement of GZE is to establish the back-up and boost the confidence of the people. GZE came to Curaçao with enthusiasm to establish a successful business model of cooperation with Curaçao government and people. The well-established legal system, the hospitality and honesty of the people attracted us here. “Win-win’ is not a slogan, but an intention from our heart. A prosperous Curaçao is your dream as well as our objective. You may see and judge from the plan of Heads of Agreement (HoA) as well as the alternative plan of the HoA Addendum which always put the benefit and future of Curaçao people as the primary objective. We believe that, if all parties share a common ultimate objective, the project will move towards success.